Nurturing conditioners and fortifiers add vitality, suppleness, and silky luster to your crowning glory. Fortunately nature provides the right ingredients for every hair type. Rinses, poultices, hair tonics and other conditioners can make dull hair shine. Pick treatments appropriate to your hair type. Make lemon rinse by mixing ¼ liter (about 1 cup) boiling water with the peels from 2 lemons and steep, covered for 20 minutes. Strain and squeeze out the lemon peels thoroughly. Let the lemon water cool to warm before rinsing. To make a conditioner containing essential oils, which can help regulate the activity of your oil glands, mix 3 tablespoons of cider vinegar with 2 drops of sage, juniper, and lemon oil with 7 ounces warm water. Rinse with it, then rinse again with tap water. To rid your hair of oil and make it smell wonderful, make a vanilla rinse by mixing 3 ½ ounces (just short of 1/2 cup) each of white rum and beer, 2 eggs, 1 teaspoon lemon juice, and ½ teaspoon vanilla pulp. Massage into your hair. Rinse after 10 minutes and wash your hair thoroughly. 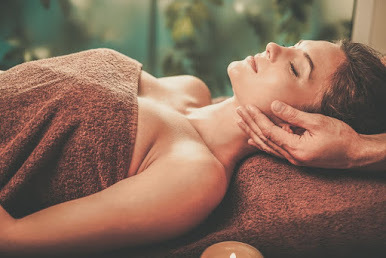 A tea tree oil poultice will reduce oily buildup, to make one mix ¼ cup of almond oil with 2 tablespoons lemon juice and 10 drops of tea tree oil, comb through wet hair, and leave for 30 minutes, rinse then wash.
For healthy scalp and lustrous hair, mix 3 drops each of neroli, chamomile, lavender and sage oil in the palm of your hand and spread through your freshly-washed hair, do not rinse off. Avocados are outstanding sources of moisture. To make a deep conditioner, puree the flesh of 1 avocado and mix it with 2 egg yolks and 1 tablespoon molasses. Knead the paste evenly into your wet hair and rinse thoroughly after 30 minutes. Apply once a week. Bananas also make a nurturing conditioner. Mix one crushed banana with 1 tablespoon avocado and massage the paste into your hair and scalp. Cover your hair with plastic wrap and a towel, leave on for 20 minutes, then rinse hair with warm water and wash with a mild shampoo. Thyme protects your hair from drying out. To make a thyme rinse, pour ¼ liter (about 1 cup) boiling water over 3 tablespoons of thyme. Steep for 10 minutes, the strain and cool to lukewarm, apply with shampoo.